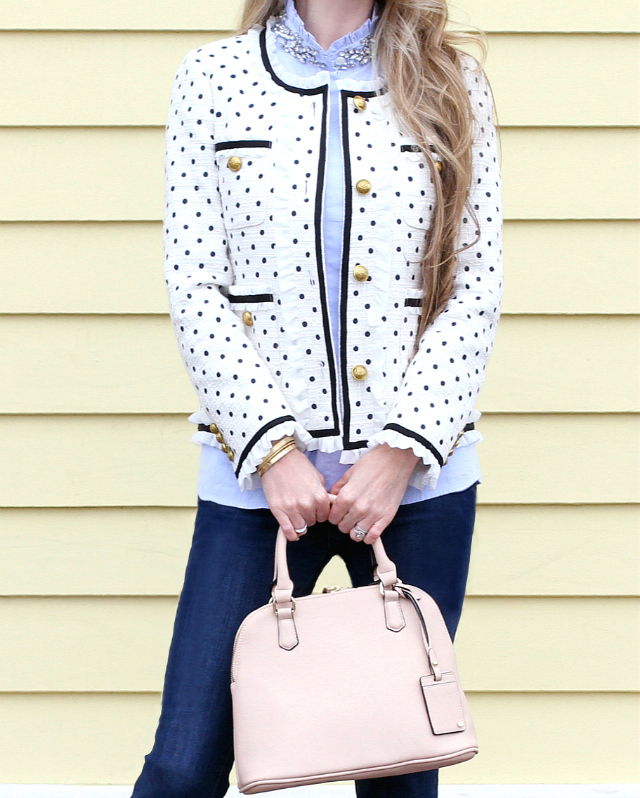 Nothing says "ladylike" more than a tweed or bouclé jacket. But this one. Oh my goodness...this one is nothing short of amazing! It just screams feminine-chic! 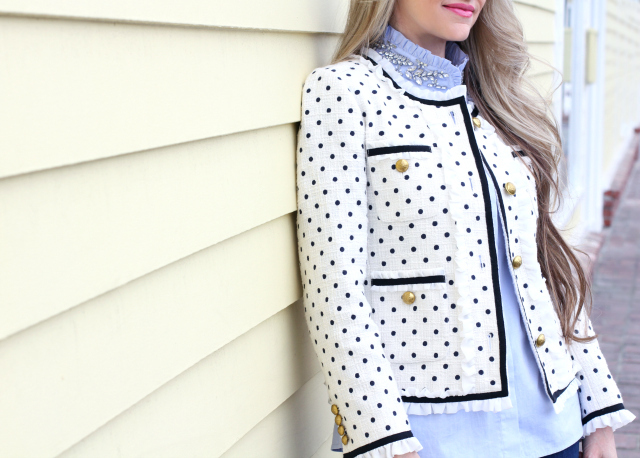 The polka dots, the chiffon ruffles, the contrast trim, the gold buttons -- even the blue pinstriped lining that peeks out through the jacket while it's open -- it's simply perfection! J.Crew has been releasing so many stunning pieces these past few seasons, and this is definitely one of them. This lady jacket is part of their special "Collection," which J.Crew describes as "rare, special, and entirely worth it." Very apt, because these pieces truly are stand-out, one-of-a-kind pieces that boast the most gorgeous details. The colors, the patterns, the fabrics -- all of them downright swoon-worthy in their own right. They're also very high-quality. As a result, they cost a pretty penny. That said, if you can nab any of them during a special promo like I did with this jacket, don't even think twice! Let me tell you how I was able to score this beauty on major sale! This amazing jacket immediately caught my attention when it was first released online several months back, but the hefty price tag kept me from pulling the trigger on it. Then, of course, it sold out in all sizes in a hot minute! Not surpising at all, but I was bummed, and shrugged it off, knowing I wasn't prepared to buy it unless it went on sale anyway; it just wasn't in my budget at full price. Hoping it would be restocked -- and even better, marked down -- I went ahead and bookmarked it on my cell phone, as I do with most of my wish-listed items, checking it from time to time for any size pop-backs and/or sale promos. A few sizes would pop back on the rare occasion, but never my size and the sizes that were available, would immediately sell out...again. I wanted to first share the background of my shopping escapade with you in the chance it helps you to score one of your favorite wish-listed items, too! Patience pays off, and bookmarking your favorite pieces on your cell phone or computer makes it really convenient to check an item's status. If the item appears to be completely sold out, it doesn't hurt to keep checking! Items are often returned and/or periodically restocked, and you may have the added advantage of finding them on sale! 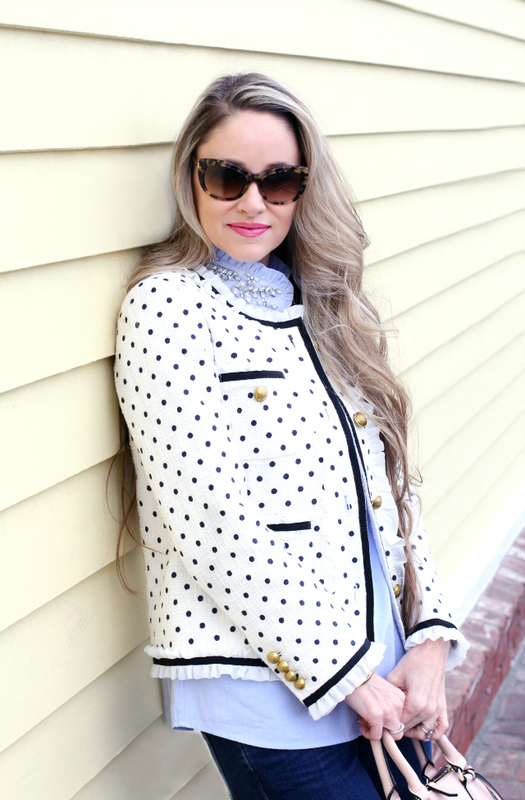 I love that this lady jacket can be styled in a myriad of ways: dressed up with a classic sheath dress or pencil skirt-and-blouse combo, or dressed down with a blouse and jeans as I'm doing here. This time of year, a medium-weight tweed or bouclé jacket works best, especially for those chilly days or evenings when you need a warm layer but don't want anything too thick or substantial like a winter coat. What's the difference between tweed and bouclé? Tweed is a type of weave or finished product, whereas bouclé is simply the type of yarn that is often used to produce a tweed product. (Here is a handy fabric glossary, which serves as a great reference tool for all different types of fabrics/textiles, in case you're curious.) It's an ideal option for this transitional period between Winter and Spring, and with proper care, will last years. There are so many lovely tweed/bouclé jacket options available right now, which I've rounded up for you in case you've been wanting to add one of these jackets to your wardrobe! Now, what to wear with your jacket? 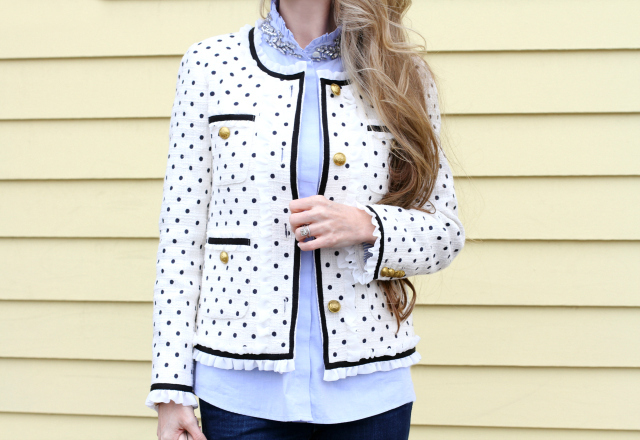 Any basic blouse will look lovely, but I suggest layering an embellished-collar or ruffled-collar blouse under your jacket; it's such a cute pairing and a nice way to add more texture and interest to your outfit. For this particular look, I chose a blue, button-down shirt with the prettiest ruffle-neck and embellished-collar detailing. This shirt also happens to be from J.Crew, albeit a few years old. 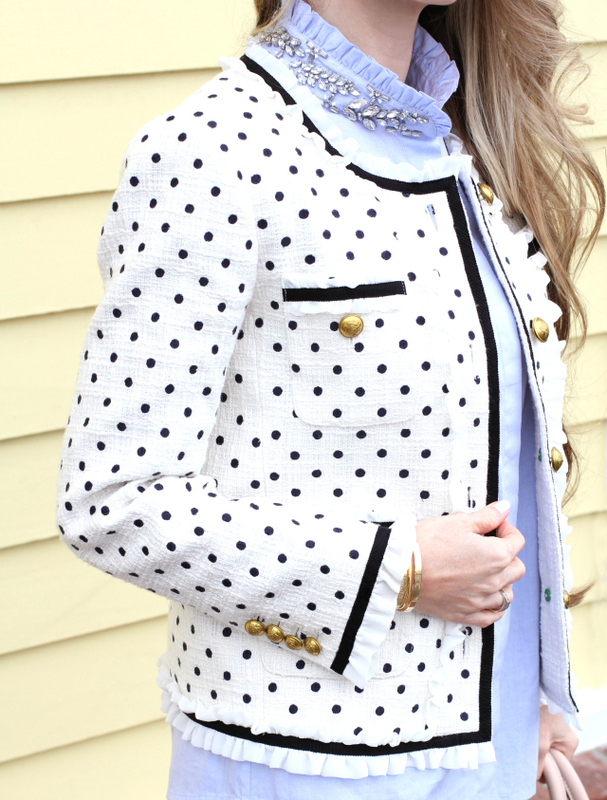 I like that the ruffled collar and crystal embellishments peek out from the collar of the jacket -- such a pretty detail! The shade of blue is also a nice contrast to the polka dots and really allows them to pop. Since most jackets in this style tend to have a more boxy silhouette, I suggest 1) sizing down for a flattering fit; and 2) balancing it with a closer-fitting piece, such as a pencil skirt, sheath dress, a pair of slim-fitting pants or skinny jeans. 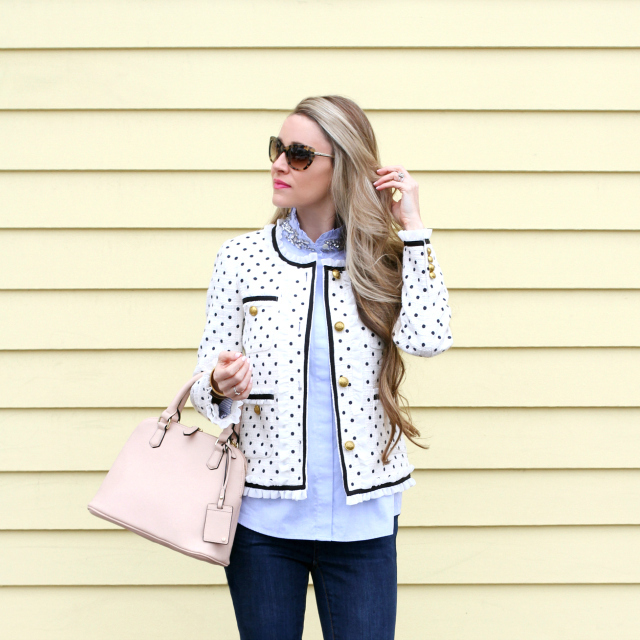 I chose my favorite pair of non-distressed, dark skinny ankle jeans for this look; they keep the lower half of the outfit sleek and streamlined, and they don't compete with the pattern of the jacket, which already has details aplenty! 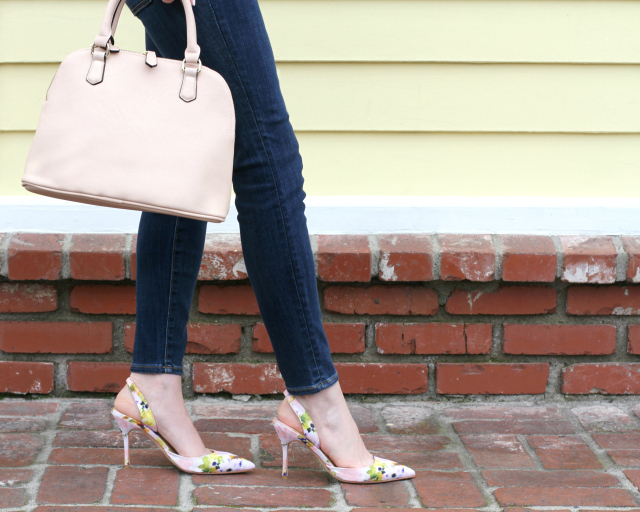 To add another layer of whimsy to an outfit, add a pair of floral pumps. 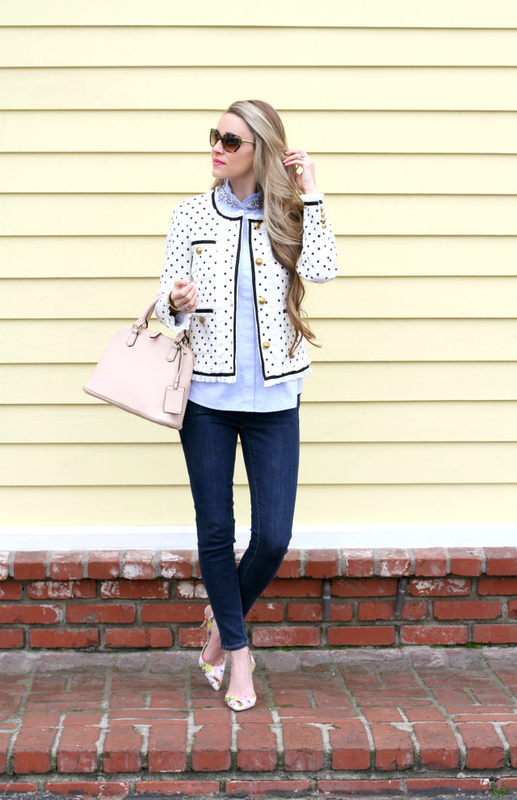 I opted for my favorite floral slingback pumps -- I adore the pastel tones and the muted, watercolor-floral print of these ones so much -- plus, they pair nicely with the polka dots in the jacket to give an über-feminine look. Finish the look with a blush (or other pastel of your choice) satchel/crossbody, and you have the perfect recipe for a feminine-chic outfit! You can wear it to Sunday brunch/tea, a bridal or baby shower, girls' night out, date night, and everything in between! 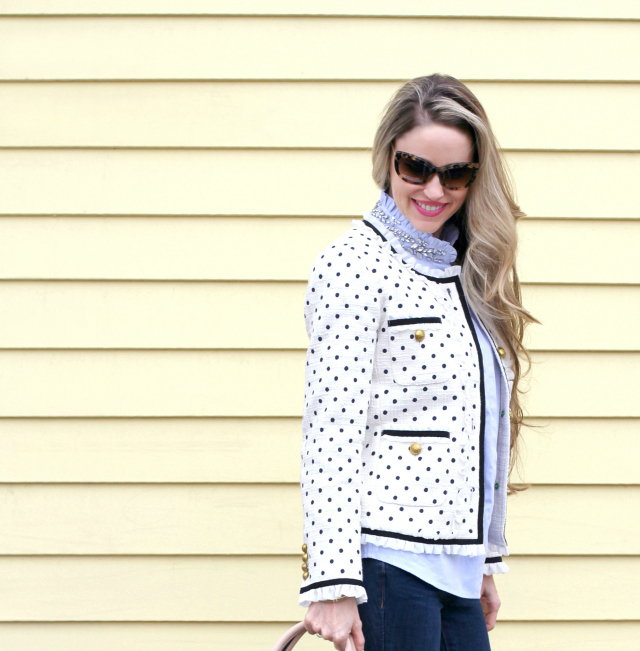 I'm completely smitten with this jacket and outfit, and hope you love it as much as I do! What are some of your favorite ladylike pieces?